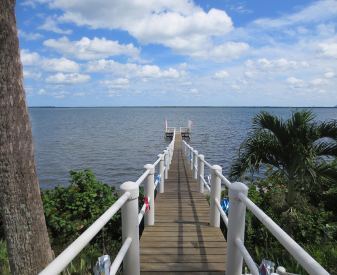 Panoramic Wide Water Intra coastal Views and beyond from this water front Indian River Dr. home sitting on 2+ acres with a Dock. A 1.3/4 mile view across the river to Hutchinson Island. 103 Ft of water front, Very nice 165 Ft Dock with two decks and stairs leading to the waters edge. Lushly landscaped with mature trees and fruit trees, large private patio for entertaining overlooking the expansive back yard. Meticulously maintained and shows pride of ownership, with quality throughout. Completely renovated 2000 from the studs out and new windows, 2700 SQ FT living area, Split Plan, 4 Bedroom, 2 Bath, Light and bright open floor plan designed around the view. Corian in Kitchen, custom cabinets, breakfast bar , all new high end appliances. Well above Flood plain, 22 ft elevation, Dock has stainless steel fittings and all pilings are covered with PVC for low maintenance, whips to secure your boat. House was built to withstand hurricanes and had no damage from the 2004 and 2006 hurricanes, Accordion style shutters. Concrete Block construction with rebar and concrete poured between the blocks, Interlocking S Tile roof, 2 car garage with a metal roof. Southern Pine rafters and redwood eaves. $6000.00 High tech water filtration system, higher quality than bottled water. New AC. New septic leach field 2011, Zoning allows possible building of in law or guest house. Great location, easy access to downtown, shops, and restaurants via Walton or Midway. Enjoy the river view from the Florida Room, entertain on the patio, or stroll to the dock and take a boat ride.